My son recently turned 13 and yes, he instantly turned into one of those grunting teenagers! He's gone away on a school camp for two weeks so I thought I'd surprise him by doing a mini-makeover of his bedroom while he's away. Here's the room before (sorry, not a great pic). 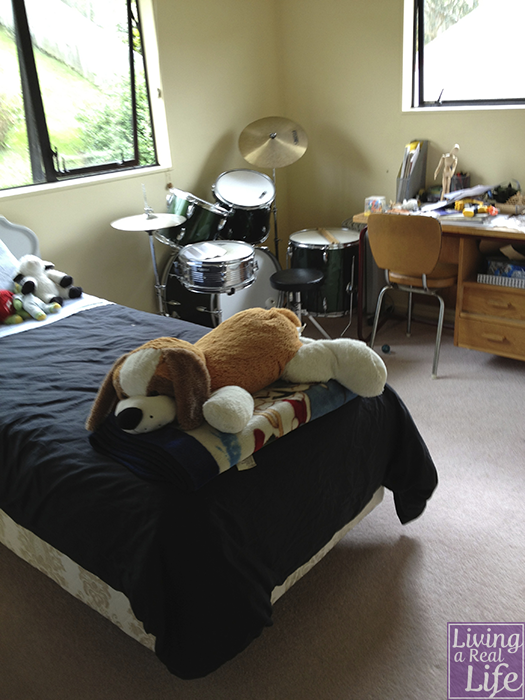 There's a lot of stuff in his room (the other side is even more cramped) and, to be honest, it just wasn't working. So, I've changed the layout. I'm also planning a colour update to a more mature palette (hiding under this black duvet is a Woody and Buzz Lightyear blanket!). Because we live in a rental, I can't change the colour of the walls or the icky pink carpet. There are also insipid creme roman blinds which you can't see in this photo. I've come up with a tricky way to disguise those. I've been working hard and I will reveal all in the next few days. My inspiration for this room makeover comes from Sarah Richardson who is my all time favourite interior designer. I love her work and when I saw her makeover of this tween room I knew that I had to do something similar for my boy. Click the image below to see more photos of this room.